The new spring/summer 2012 range from Harry Hall incorporates the season’s latest trends with the practicality of long lasting everyday riding wear. New to the range is the Bowness soft fleece hooded top with a two button fastening to the side of the neck. The Bowness also features a contrasting stripe lining in the hood and kangaroo pocket. The Harry Hall logo is embroidered on the arm and the Union Jack is also featured on the back hem. Ideal for the colder days and those frosty mornings in spring the Bowness is made from 100% Polyester. 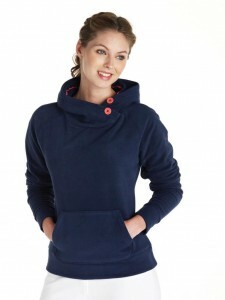 Available colours Candy and Navy and in sizes Small to Extra Large, the Bowness retails at around £31.99. Bowness Jnr is also available in Candy and Navy, in sizes 3 /4, 5/6, 7/8, 9/10, 11/12 and priced at around £21.50.